WordPress can be just about anything you want it to be. Blog? Check. Portfolio for your art? Check. Home of your business, CRM, eCommerce Store, App showcase? Check, check, check, and check. And of course there are many more things I could list. One of which, is that WordPress can be used as a Wiki or Knowledge Base–just like Wikipedia or any support/documentation site you’ve ever used. There are a few ways this can be accomplished: through plugins, themes, or a combination of the two. In today’s post however, I’ll be focusing on free and premium plugin options. Why? Because I feel that when it comes to adding functionality to a website, it’s almost always best to do that through a plugin. There are instances where you may want to use a theme designed specifically as a Wiki or Knowledge Base–and I’ll talk about that briefly towards the end of this post–but in most cases, and for most users, you already have a website with a theme you like and all you want is the ability to add a wiki or knowledge base to it. Which is what a plugin allows. The Official WordPress Plugin Directory was at one time, about two or three years ago, pretty full of wiki and knowledge base plugins. Most of those are either in disrepair–i.e. have not been updated in a very long time–or do not have great reviews to begin with. The two I’ve decided to highlight in this post have four or five star ratings, a relatively large amount of downloads, and are currently being updated. Or in other words, as few and unpopular as they might seem when compared to other types of plugins, they are nevertheless the best out there right now. The first and most popular (by a large margin) is Wiki (lite) by WPMUDEV. Personally having used this plugin (and its premium counterpart) much more extensively than the others in this post, I can vouch for its quality more than any of the others–which I have, of course, installed and tested but not put to use of weeks or months. With this plugin you can quickly and easily create a Wikipedia style entry for any topic/subject you want. Once installed it lives within its own primary sidebar menu in the WP Admin called Wikis. Basically, each Wiki entry is a custom post type–but without any tags or categories, which can be a bummer at times. Nevertheless, you’re still able to accomplish a basic but functional wiki entry with each new post. I was able to create a wiki dedicated to my family’s history. Each person, town, or event of significance was given its own page and all of the family members who have accounts to our family blog can log in and edit/update the wiki via both the front and backend editors. It’s really fun and functions exactly as advertised. However, the one big disappointment I came across with this plugin is that it does not come with an archive page template. Instead it comes with a widget that displays your wiki entries in your sidebar. Which is nice, but obviously if you want to have a page dedicated to displaying and sorting your wiki entries, you’re going to have to build it yourself. True to its name, the Very Simple Knowledge Base is nothing more than a shortcode [knowledgebase] that triggers a page template for displaying certain blog posts and categories. Once installed, there is no menu or settings to configure in the WP Admin. As you can see above, the plugin simply uses its shortcode to create a documentation style display. If you wanted I’m sure you could compliment this plugin with a custom post types plugin or a plugin such as WP Hide Category that filters your blog feed; that way you could write documentation style post without them appearing in your regular blog roll. If the options above are leaving you feeling like the pickings are a bit sparse, well, they are–but there are some more robust and feature rich options available at the premium level that might better satisfy you wiki and/or knowledge base needs. Notably however, there is still no ability to create wiki categories and tags. This, to me, seems like it would be common sense. Combine that with the fact that you still do not get a nice archive page with the pro version and it can be a bit frustrating. But all complaints aside, there’s a lot to like here too. And, if you go through the trouble of copying/editing your theme’s archive.php file you can end up with a nice looking as well as nicely functioning wiki with a lot of useful features beyond the free version. Based on my testing of the various plugin in this post, Knowledge Base is perhaps the most polished and easy to use. Not only is the setup easy but it displays beautifully on the front end–which is a big deal! Granted, it is designed more for documentation style pages as opposed to wiki style pages (particularly with the voting system) but I think it could work as either if needed. UserPress is marketed (and certainly priced) as a higher end solution that any of the other options here. However, having not tested it extensively, I’m a little dubious that it is worth its $99 price tag. Especially considering that that does not include indefinite updates or support, but only one year’s worth. However, with those reservations out of the way, I can say that it does appear to be a high quality wiki solution that is actively updated and developed. And iFrame preview, which allows you to preview other pages without leaving the one you are currently reading. So at the beginning of this post I said that there may be a few instances in which a theme that provides both the design and (possibly) the functionality of a wiki and/or knowledge base. In the interest of being thorough, lets take a look at what those instances might be before we wrap up this post. The two instances in which having a whole theme dedicated to displaying and functioning as a wiki or knowledge base is if you have a standalone site dedicated to that sole purpose or if you have created a second installation of WordPress on a subdomain of your current site. One dedicated to support, for instance. In either of these cases having a theme that comes with all of the page and custom post type templates you could want is actually pretty awesome. I know that some of the plugins mentioned above fall short in this area, which may require some design tweaks on the part of the end user. For some, that’s a deal breaker; because let’s face it, not everyone is a great developer/designer–that’s why they’re buying pre-packaged themes/plugins in the first place! For those interested, Themeforest has a decent amount of Wiki/Knowledge Base WordPress themes available for purchase from a number of different theme authors. If you read through my descriptions of all the plugins featured in this post, you probably picked up on a note of disappointment throughout. And I must admit, it’s true. While all of the plugins I presented will definitely do the job of turning WordPress into a Wiki or Knowledge Base–and do it well–I can’t help but feel that because this is perhaps a less popular or less profitable specialty use of WordPress that the tools created for it are under designed and under developed. It’s not that they’re missing the core functionality that makes them function properly, but it’s the smaller stuff, the polish. Like the lack of archive page options or the ability to add post taxonomies to wiki entries. While not absolutely necessary, I think features like that would go a long way towards making this obviously viable concept more enjoyable for both creators and readers. On the whole though, if you’re bound and determined to create a fantastic wiki or knowledge base using WordPress–it’s possible with these tools. As with almost any plugin, theme, or (in a broader sense) WordPress installation you are working with tweaking is part of the fun and usually required to one degree or another in order to achieve exactly what you’re after. So there you have it. That’s my overview of WordPress Wiki and Knowledge Base Plugins for WordPress. Have you used any of these plugins? Did I perhaps miss one that you enjoy and want to recommend? Leave it all in the comments below! Thank you for this great article. Here’s my humble review. I tried both Wiki from WPMU and Knowledge Base from Codecanyon. The second one is really smple to use and easy to edit and gives you a lot of freeddom with the code. WPMU Wiki is more for people who wants to have a perfect backoffice to edit and customize everything. Both WPMU Wiki (full version) and Knowledge base from CC are excellent. Very simple Wiki does the job , but you definetly need to spend some bucks to have a professional tool. There is no way to reach the developer without paying for support. The one email link I found took me to the ‘pay for support’ page. Look at the listing for this plugin on the WP plugin list, and you’ll see 17 one star reviews, all mentioning the same issues. I think that this is just one of those times that it is worth spending a few extra dollars to get software dedicated to this task. Now if you are on a budget, then these will surely work. Thanks. This is a new plugin to me so I appreciate the information. Every little bit helps on the learning curve. Also good to get extra tips from the other comments. The site I have for my link here is old and the old theme doesnt like plugins much but will try this for other sites that have newer themes. Mr. Farmer, the current version of Wiki was released in July 2014. Was the smiley face a way of saying ‘just joking’? I bought into the idea of Wiki Pro but have been left pretty disappointed. The fact that you advertise it as a fully functioning Wiki and even show a picture of Wikipedia in the image you have for it on your site is very miss leading. The point raised above about not having any proper sorting, not being able to create templates and a few other features, like on my site if you are logged in as admin you cant use the front end but as a subscriber you can. Your support is well meaning, but a little inept. I am at the point of requesting a refund of my membership. 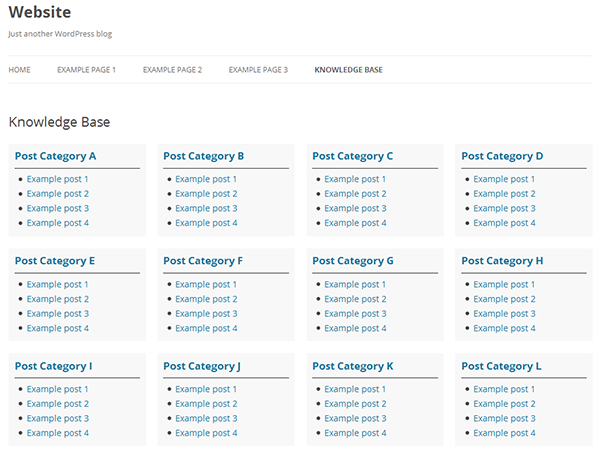 I’ve tried “Knowledge Base: Wiki WordPress Plugin” and the features and advantages are really good. Knowledge Base: Wiki WordPress Plugin is great for knowledge base support. However, I have removed the plugin and installed WordPress wiki theme that is great also…. I’d like know if exist any plugin for I register data, I have a site of franchises and I’d like register information about franchises in my site , how in a Database with fields custom and after show it for my public. I appreciate this article and the technologies it describes, however briefly. But I am a bit bewildered. If you want a Wiki, why not just create a Wiki? Creating and managing a full-featured, high-powered Wiki is duck soup compared to managing a WordPress site and making the resulting Wiki look like it’s an integral part of your WP site is trivial. Sometimes I think the Swiss Army knife approach to WP does an excellent product a real disservice. We’ve glued, stapled, tacked and paper-clipped so much functionality to the edges and bowels of WP that it feels fragile and difficult to maintain because it is. I sort of rue the day that WP decided to become an application platform and a site builder and a discussion board and a…. It was easily the best blogging-only platform on the market. Now it is earning a reputation as a very difficult and complex piece of software to master with far too many moving parts. This is a partial explanation for the approximation that there are between 9 and 16 million WordPress blogs with zero content, blogs that were started and abandoned by people who probably in most cases started out with something they wanted to say or build, then abandoned it. So I ask again. Why not just make a Wiki? Thanks Dan for the perspective which I’ll clip and save as I’m also still bewildered. Everyone check out XWiki and host it free on OpenShift. The latest themes look damn good. It’s a solid wiki, embedded solr, export PDF etc. It just feels solid. First off our url is for our existing joomla site, we are currently rebuilding with Word Press, sorry about that. But I have a question, we are building a knowledge base wiki using Mediawiki, and I have gotten used to the nuances of building our Mediawiki site. It’s a tad difficult, it requires a certain amount of intuitiveness to configure the wiki with all its plugins and features, but it is one heck of a piece of software! Would you recommend switching up our efforts and use a WP wiki plugin? The WP plugins sure are attractive, having the same user interface and consolidating our software and needs. But on the other hand, Mediawiki is the pioneer in many ways and the thousands of calls to data it is capable of with its parser functions and much more, I am not sure if that can be topped. I know this is a personal call on a personal level, but if you were neck deep in developing a Mediawiki site, and then some pretty good reviews came along about WP wiki plugins, would you deeply consider abandoning efforts with Mediawiki? In other words, can the above plugins be compared to a dedicated wiki software such as Mediawiki? Thanks for any feedback on this, your help is greatly appreciated. Truly the best plugin on that list is the WikiPlugin by WPMUDEV because its the only one that offers proper formatting for sub wikis, and its the best one for websites that are aiming to be like a Wikipedia. It is WikiPlugin, i like to create a blog wikipedia.